These included new stained-glass windows, a new pulpit, communion rail, and vestments, re-painting of the Lady Altar, and the purchase of a golden frame to house the icon. Donations of about $11,000 were secured in the effort. By the time of the formal ceremony of installation on the Feast of St. Nicholas (December 6), the people of the parish—societies, schoolchildren, altar servers, and all invited guests—were well disposed to receive their new Queen. Due to inclement weather, a 500-person procession began in the school. The boys held tapers and the girls held lilies, and at 9:30 that morning the altar boys led the parade into the street—down Somerset to Eager and then to Aisquith. The icon in its current home at Sacred Heart of Jesus Church in Baltimore, where it has been since April 15, 1986. They were followed by the newly established Archconfraternity of the Holy Family (three units: for the married and for single men and women) and heads of all the other parish societies, each with their own banner. A group of dignitaries from the city came next, and while the choir sang a settings of the Magnificat Anima Mea, 12 women in ranks of four guided the icon to the front steps of the church. They had been selected to carry the picture of OLPH to her place of honor. As the procession arrived at the door to the church, Father Thaddeus Anwander, C.Ss.R., received the image and placed it on a portable throne. Alongside him were Father Joseph Wissel, C.Ss.R., the rector of St. Alphonsus, and fellow Redemptorist Fathers Michael Mueller, Francis Eberhard, and Augustine Pingel. Onlookers crowded the streets. The enthronement of the picture was undertaken during the singing of the Salve Regina. A High Mass followed. This day began a triduum of festivities. On December 7, Father Wirth, C.Ss.R., pastor of St. Michael the Archangel in Fells Point, sang a solemn High Mass for the first time at the OLPH Shrine. On Tuesday, December 8, Father Anwander took his turn. Services on December 8 closed with the singing of the Te Deum. By the end some 2,500 hosts had been distributed. Shortly before the triduum began, a young Lutheran girl, Mary Behrens, had arrived in the United States. At age 18, this youngster crossed over on the ship that brought a “miraculous picture” destined for Baltimore. She was unable to gaze upon it while on board, but she was satisfied that December, when she attended the ceremonies at St. James. The sermons of Fathers Wirth, Wissel, and Eberhard made such an impression that she began to pray to Our Mother of Perpetual Help. On April 25, 1869, she was received into the Catholic faith, and her baptism took place at St. James the Less. Behrens later entered the School Sisters of Notre Dame in Milwaukee, Wisconsin. A spinal disease confined her to bed for 38 years, a cross she bore with courage until her death in 1926. On February 22, 1869, a letter was received from Pope Pius IX, granting a plenary indulgence for those who visited the shrine of Our Mother of Perpetual Help. The day for the indulgence was designated by Archbishop John Spalding of Baltimore: the last Sunday in May. The papal indulgence of 300 days was also granted to those who made visits to the shrine at any other time of the year. Both grants were made for a period of 10 years. Thousands took advantage of the privileges accorded them. When Pope Leo XIII ascended to the papacy, he extended the indulgence in perpetuity for as long as the shrine endured. Moreover, he extended by two days the plenary indulgence. That is, December 6, the anniversary of the enthronement of the picture, and June 27, the feast of Our Mother of Perpetual Help, could be added. By 1880 the gas lights that had been placed on either side of the icon had caused considerable damage to it. Brother Hillary Froelich, C.Ss.R., one of the province’s most gifted artisans, retouched the picture to its original glory. He also re-gilt the frame and inserted a plate glass to protect the icon from the elements. On the occasion of the icon’s 25th anniversary of enthronement, the Redemptorists celebrated with another triduum. On the final day, Cardinal James Gibbons of Baltimore was in attendance. By a papal brief, only some images of the Virgin and Child could be deemed worthy of “crowning.” The Perpetual Help icon was one such image. On July 26, 1899, the two figures in the icon at St. James the Less were crowned in solid gold and ornamented with diamonds, rubies, and amethysts, valued at about $2,000, and supplied by an anonymous donor. Eventually her name became known. It was Miss Anna Helldorfer, the aunt of the future rector of St. James, Father Nicholas Helldorfer, C.Ss.R., as well as three School Sisters of Notre Dame. 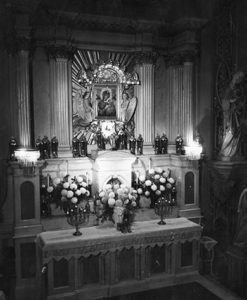 The initial altar that served as the temporary home for the icon at St. James was dismantled and replaced with a new marble altar on April 7, 1869. It was completed and consecrated on May 1. In its altar stone were placed the ashes of the martyrs of Florida, a piece of the altar from the chapel of St. Mark in the Fort of St. Augustine, Florida (dating to 1565), and a piece of the wall of St. Augustine Church in Florida. Bishop (later Cardinal) Ignatius Persico, OFM Cap., of Savannah was the consecrator of the new shrine. During the Mass of celebration, 100 children received their first Communion. Some photos of the altar accompany this write-up. On Monday and Tuesday a lot of heavy moving. Staff took away furniture and appliances; Father Wichland’s workers moved a lot of equipment, furniture, office supplies to their new quarters at old St. John Church, 901 E. Eager Street. Today Brother Raphael and Father Tom Burke came to take the picture of OLPH, the first brought to the U.S. for public veneration and installed at St. James in 1868, to enshrine it at Sacred Heart of Jesus Church in Highlandtown. It was the decision of the Provincial administration to put it at Sacred Heart. St. Wenceslaus and Immaculate Conception, Bronx, also had requested it. Eight days later, Father James Geiger, the pastor of St. James the Less, turned out the lights. While ostensibly the transfer was made to effect an increase in devotion, the facts may be supplemented by some additional information. The first is that the church building was in serious decline and the congregation along with it. A period of renewal was contemplated and the necessities of the physical plant attended to. In February 1973, Bishop Naomi Durant, a Pentecostal minister, was in search of a space to rent and had applied to the pastor, who granted her congregation the privilege of worshipping in the church. For ecumenical grounds and for a continuous revenue stream, it was decided to lease the space while ministering sacramentally in the parish hall, a much smaller venue, and elsewhere in the neighborhood. Redemptorists remained in the house throughout this period. Naturally, to avoid any difficulty with the new tenant, the OLPH icon had to be removed. Curiously, there is no documentation related to the actual transfer of the icon to St. Wenceslaus, but there is a program from its removal from St. James as well as a letter from then-Provincial Father Joseph Kerins, dated April 16, 1973, instructing Father Don Lindsay, at St. Wenceslaus, that no decision had been made about the transfer. That decision came on July 20, when Kerins again wrote to Lindsay, telling him that the Extraordinary Provincial Council had authorized the icon’s receipt by St. Wenceslaus. That did not seem to motivate Father Lindsay, who had a month prior (June 25) explained to his confreres at St. Wenceslaus that they were going to be hosting the icon thanks to his “bid for [the] OLPH pic at St. James.” On July 28 he again went before the St. Wenceslaus community and presented the arrangements for the transfer of the icon. There would be a triduum and procession through the streets. He also discussed the invitation to preachers for this occasion as well as the invitation to the cardinal and other parishes. He raised the problem of security for the picture and placement within the church. The transfer date was set for September 30. Father Ted Heyburn, pastor of St. James at the time, was the principal celebrant on the icon’s translation. Father Kerins was not in attendance but later wrote Lindsay that he was sure that the ceremonies were of “great satisfaction” to him, the rectors, and all in the parishes. At the time Father Jim O’Blaney was rector of St. Wenceslaus, but shortly after the installation of OLPH at St. Wenceslaus he was called to serve St. Mary’s in Annapolis. Father Lindsay was appointed rector, despite some reservations by Father Kerins. Although we have been using the church full-time since August 29, this is the official day of re-opening the church. It took us three years, but we did it. Archbishop Borders was main celebrant. Father Provincial concelebrated with a host of other priests. Father Heyburn was the preacher. At noon the procession left the yard at IND [Institute of Notre Dame] and was led up Aisquith Street by the Drum Corps from St. Michael’s Parish. The school children followed. Next came the religious and the priests, the parish council. Father Wichland carried the picture of OLPH. Finally the archbishop came. After entering the church, the picture of Perpetual Help was installed in the Shrine altar. About 800 people were in attendance. Truly it was a day the Lord had made. The parish of St. James and St. John had again fallen on hard times. The number of congregants could not sustain such a large and costly operation. The dean for the vicariate in Baltimore in which the parish fell, Bishop John Ricard, SSJ, was well aware of the difficulty and conducted some “town meetings” with parishioners about their future. The response was tepid. He requested meetings with the Redemptorists to arrive at a solution. When it was determined that the Redemptorists would leave St. James, the bishop decided that it would close in favor of nearby St. Francis. It was announced on January 19, 1986, by Bishop Ricard that St. James would be suppressed. On June 17 the fathers at Sacred Heart of Jesus, who had had the OLPH icon in their possession since April, discussed a new shrine. The icon’s dedication would take place on Our Lady’s feast day, June 27, with a triduum in her honor and preaching by the rector of Holy Redeemer College, Father Joseph Kerins. No record exists of this event. The exercises included the singing of a hymn to the Blessed Mother, a short sermon or exhortation, a reading of the intentions and thanksgivings, a special prayer to OMPH, the recitation of the Litany of Loreto, benediction of the Blessed Sacrament, and blessing of the sick with the picture. The blessing occurred at the altar rail, where the faithful were exposed to the miraculous image for reverence. In the following weeks the attendance at these devotions averaged about 400 people. On the very first day of the St. James devotions, one of the readings of thanksgiving came from a Mrs. Hoppel of Chase Street in Baltimore. She indicated that only the month before, she had been at death’s door due to uremic poisoning, from which she had suffered terrible convulsions, and that the doctor had called for the priest to administer the last rites of the Church. On the strength of such stories, perhaps it’s no surprise that within six months the numbers in church had climbed to a thousand, making seating difficult. 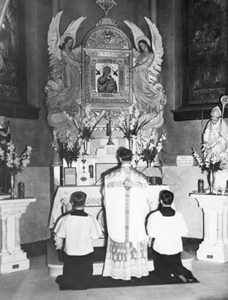 In 1966, for the centennial celebration of the OLPH icon at St. James, bus trip pilgrimages to churches in possession of OLPH icons were arranged through Father Nicholas Helldorfer, C.Ss.R., and a former rector of St. James. At the time Father Henry Sattler was pastor, and he invited members of the Maryland parishes to come to St. James. The occasion doubled as a promotional moment for Blessed John Neumann’s canonization cause as well. All proceeds from the sale of dinners for pilgrims would go toward the school. The parish also held its own triduum in celebration of the centennial. This occurred between Thursday, September 16, and Saturday, September 18. Father Joseph Manton, C.Ss.R., of Boston’s Mission Church led the ceremonies, followed by Father Ronald Connors, the provincial superior. The last day of the triduum accorded Bishop T. Austin Murphy of Baltimore the honor of closing the celebration. The capstone of the weekend was the celebration of a Pontifical Low Mass by Cardinal Lawrence Shahan in the church. The aggregation of the Archconfraternity of Our Lady of Perpetual Help and St. Alphonsus in the Church of St. James the Less took place on April 28, 1878. It was the third or fourth parish in the nation to do so, depending upon whose list you follow. Preceding congregations were the Perpetual Help Cathedral in Savannah (May 8, 1877); St. Boniface in Philadelphia (Redemptorist, October 1, 1877); and Most Holy Redeemer, New York City (Redemptorist, January 24, 1878). An archconfraternity had begun at Sacred Heart of Jesus on October 11, 1879. In subsequent years the numbers of members routinely exceeded a thousand. As early as 1916 the second Sunday of the month had been set aside for special devotions to OLPH at Sacred Heart of Jesus, though, as Father Dauenhauer reported at the time, no miracles had yet been recorded.